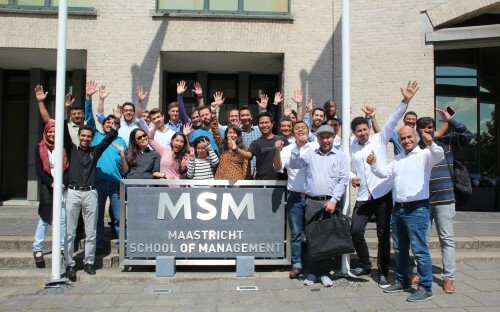 “The MBA program gives you the complete skillset you need to be a manager,” says Rafael Falcon, who decided to relocate from Indonesia to pursue a full-time MBA at the Netherlands’ Maastricht School of Management (MSM). Rafael previously had stints as an electrical engineer at big-name firms like Schneider Electric, Chevron, and Tenaris. When considering business school, Maastricht School of Management, offering an accredited MBA program at the heart of Europe, stood out. The MSM MBA offers specializations in entrepreneurship, accounting and finance, international business and sustainable development, and the digital economy, as well as industry-focused specializations like sports and healthcare management. A Career and Personal Development Track (CPDT) runs throughout the one-year program, providing with the tools MBA students need to find a job after their degree. The CPDT emphasizes soft skills development and personal branding, and gives MBA students the opportunity to meet directly with HR managers. After graduating, MSM MBA students are eligible for one-year visa, enabling them to stay in the Netherlands to search for a job. Rafael is doing just that. He’s gunning for a career in business development or supply chain planning, applying for jobs across a range of industries in Europe or Southeast Asia; determined to take the next step in his career. With an MBA from Maastricht School of Management, he’s well-placed to do so. Why did you decide to pursue an MBA at MSM? I chose MSM over several business schools after considering details like location, accreditation, and tuition fees. MSM offers better value for money than other business schools but with an excellent quality of education, international accreditation, and an excellent location. Maastricht is a lovely city to live in with a diverse and multi-cultural environment. And the school provides a broad future business network of contacts from emerging economies. Why Europe over the US? It’s not just about what goes on inside the classroom. My goals are to develop my managerial skills and get access to a more extensive network and better career opportunities. Europe offers a high quality of education combined with easy access to various countries, history, innovation, art, and culture. What stands out from your MSM MBA experience? My personal highlight from MSM are the various activities, such as workshops, networking events, and company visits, on offer. Maastricht School of Management's full-time MBA also offers an Innovation Management Course, complete with manufacturing simulations, that takes place at RWTH Aachen University in Germany. That provides a different experience from regular MBA programs. MSM also provides its students with the chance to meet CEOs or leaders from established companies—a valuable and inspiring experience. Professionally, MSM gives me more flexibility when looking for a future role. The entrepreneurship specialization provides me the knowledge to build a business and scaling it up. The MBA program completes my experience. Through the program, I’ve got to know myself better. I’ve learned to make bold decisions, understand my strengths, and focus on the future direction my career will take me. What advice do you have for anyone considering an MBA at Maastricht School of Management? Applicants should think carefully about their professional and personal goals. The value of an MBA is not only in its ranking, but in the experience as a whole, the people, and the different perspectives that make the learning process valuable. Being open-minded is key. What can international MBAs do to stand out to employers? MBA students can achieve their goals by staying motivated and confident throughout the whole process—confidence completes the qualifications. Language is one of the most important things. If you want to work abroad, try to learn the language in advance. It will be beneficial for professional work, especially jobs involving local people.